Secretary of State Mike Pompeo offered a harsh rebuke of hardline Republican members of Congress who he accused of "grandstanding" on the issue of Iran as they seek to push the State Department to end a series of sanctions waivers packages that have permitted Iran to engage in sensitive nuclear work and continue its lucrative oil trade. Pompeo has found himself under increasing pressure in recent weeks to end these waivers, which the Washington Free Beacon has reported are the source of much animosity on Capitol Hill among Iran hawks who feel the State Department is failing to enforce President Donald Trump's "maximum pressure" campaign on Tehran. The battle has pit Iran hawks on Capitol Hill and their allies within the administration firmly against the State Department, which has not yet committed to rolling back the oil and nuclear waivers. The behind-the-scenes fight spilled into public view for the first time last week, when Sen. Ted Cruz (R., Texas) engaged in a testy back and forth with Pompeo over the waivers during a public hearing. Since then, Republican leaders in both the House and Senate have sent formal letters to the State Department demanding the waivers be nixed when they come up for renewal in May. Asked about the dispute during a briefing with reporters, Pompeo accused anti-Iran lawmakers of "grandstanding" on the issue and of not fully understanding the complexity of the waivers issue. "It's ludicrous. 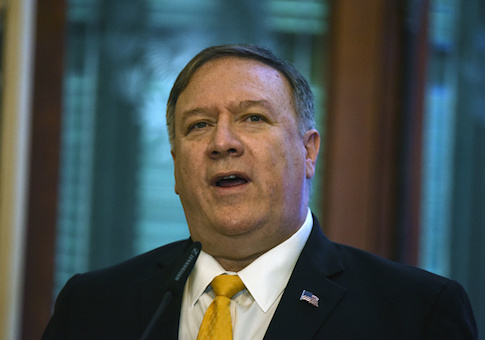 It's ludicrous," Pompeo said, when asked to respond to accusations his State Department is going soft on Iran, against both the White House and Congress's wishes. "Look, people want to tell stories, people want to sell newspapers. I've got it," Pompeo said. "Congressmen will grandstand, I've got that too." "The State Department's going to get it right," Pompeo maintained. "We understand our mission. Our mission from the president is incredible clear [sic]. We're going to put pressure on the Islamic Republic of Iran, on the regime, until we get for the Iranian people what it is they deserve, the chance to live a normal life in a state that isn't the world's largest state sponsor of terror." "That's the mission set," Pompeo explained, "whether it's sanctions or visa issues or all the other tools of diplomacy that we're using to drive that outcome, I think the whole world can have confidence that the State Department will be on the president's team … I think the data will bear that out as well." Pompeo would not offer an answer as to whether the nuclear and oil waivers will be renewed next month. Cruz, in a statement to the Free Beacon, said that he and others will continue pressuring the State Department on the waiver issue, saying that lawmakers need to understand why some elements of the State Department are angling to keep the Iran nuclear deal on life support, despite Trump's decision to walk away from it. "I have opposed this catastrophic deal at every stage, and the Senate will continue to take seriously our obligation to protect national security," Cruz said. "Ensuring that security requires ending the oil and nuclear waivers now, not six months from now after Iran has had even more time to rake in billions and build up their nuclear infrastructure." "And the Senate Foreign Relations Committee needs to understand why some in the State Department think it's a good idea to keep enriching the Ayatollah with oil billions and to let Iran keep spinning centrifuges in a bunker that they dug into the side of a mountain so they could build nuclear weapons," Cruz said. "It's false to claim oil waivers are ‘enriching the Ayatollah with oil billions.'" a senior administration official told the Free Beacon. "Zero revenue has gone to the regime in Tehran since energy sanctions were re-imposed in November. By operation of law, all Iranian oil revenue must be locked down in escrow accounts. The mullahs are not and cannot ‘rake in billions' of dollars." "The president's policy is clear and consistent. We are applying maximum pressure on the regime and denying it money to fund malign activity," the official said. One senior Republican congressional official told the Free Beacon that is has become increasingly clear in recent weeks that some in the State Department do not share Trump's desire to amp up pressure on Tehran. "It's the same people making up the same excuses for the same purpose, to keep America in the deal as much as possible," said the source, speaking only on background about the debate. "They always say that if we increase pressure then Iran will leave the deal and race toward a nuke." "It's what they said would happen if the president decertified, then if he withdrew, then if he imposed partial sanctions, then if he imposed more sanctions," the source said. "He ignored them every time and every time they were wrong. But they keep using the same excuse because maybe this time it'll work." This entry was posted in National Security and tagged Iran, Mike Pompeo, Ted Cruz. Bookmark the permalink.